Since I last wrote, weather conditions have changed drastically, in our case all for the better. After nearly two very hot months without rain, it finally rained seriously during the last week in August and the first week in September. During that period at the farm we received about 4 inches of rain. Unlike much of Wisconsin which received way too much rain, we enjoyed just enough. Then after the rains the temperatures also moderated. The resulting changes in the pastures were miraculous. Most of the pastures had appeared to have gone dormant, but two weeks of rain and cooler air woke up even the brownest pastures. Very recently we had begun planning for feeding baled hay to the sheep out on pastures, with the prospect of continuing that until cold weather and killing frosts. 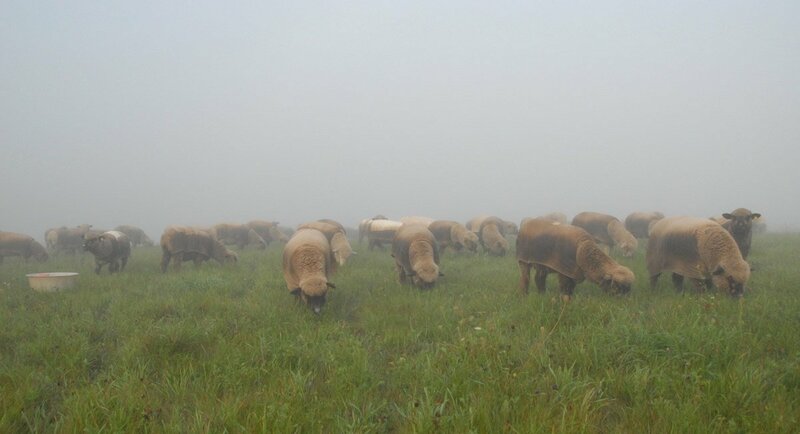 On the day following the last rain, we began grazing the flock on our hay ground, which was the last pasture with significant enough forage for grazing. 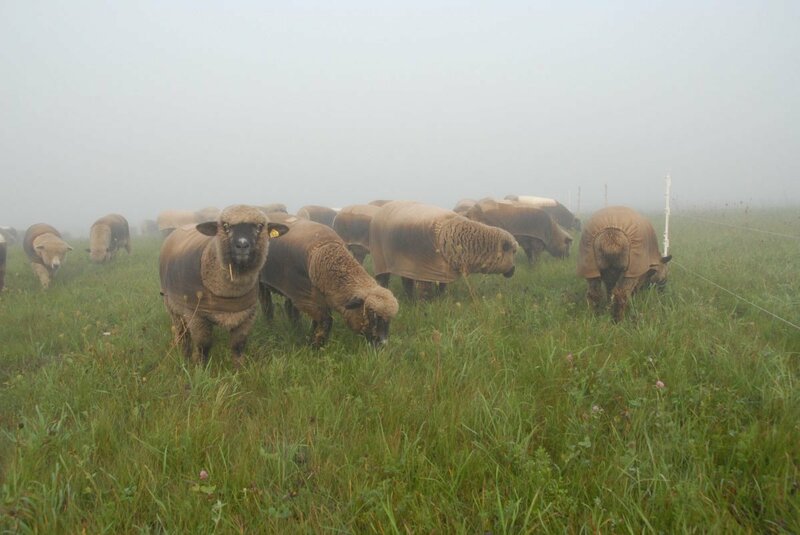 While we grazed that field over the last two weeks, all the other pastures have perked up and will hopefully provide enough grazing for the flock to get through October, especially if we get some additionally well timed rain in the near future. So all and all both sheep and shepherds are happy campers! 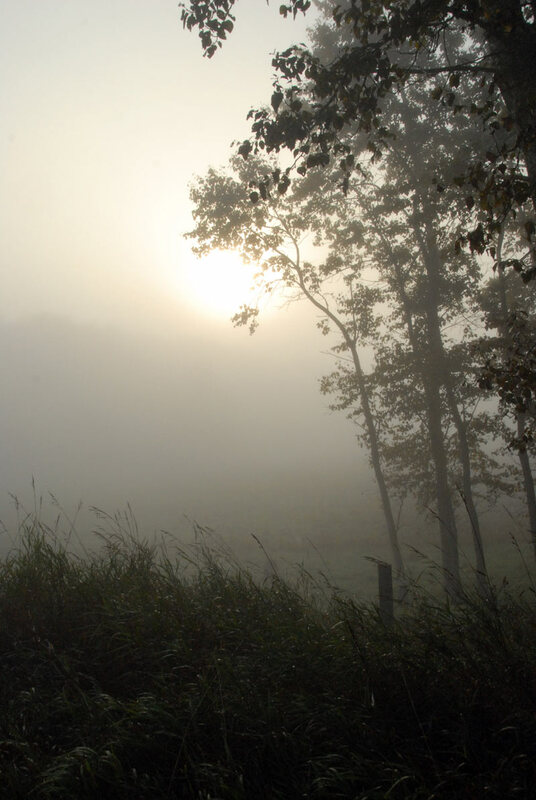 Over the last few days we have experienced dense ground fog overnight and into the morning. 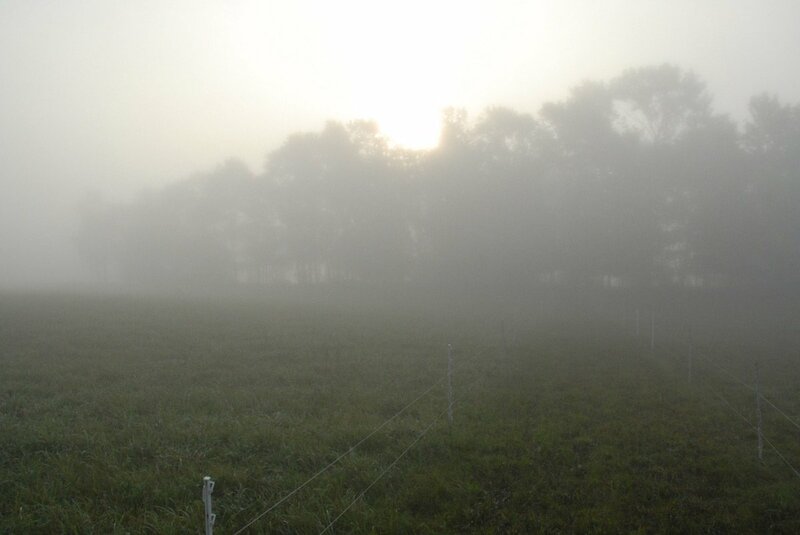 It has been an especially pleasant change of routine for me, setting up the temporary pasture fence each morning. The walk out to pasture is nearly a quarter of a mile. 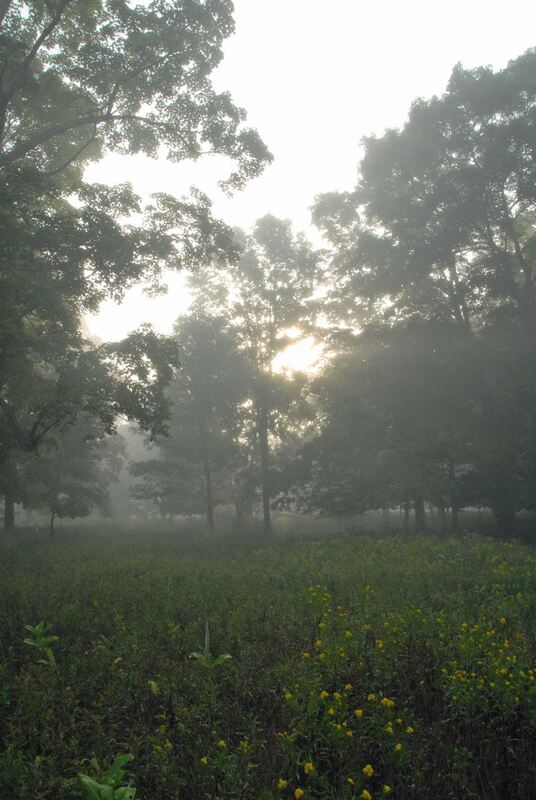 By the time I reach the pasture the sun is not quite up and the house and barns have totally disappeared in the fog. At times it is even difficult to see the opposite end of the area I select for the day’s grazing. This is the view from the edge of the pasture looking back to the east toward the maple grove. Somewhere down below is the path the sheep take to get out to the pasture. Once they get this far they will then follow the raceway out in the center of the pasture. After setting up the day’s temporary fence line, I walk back to the barn to let the flock out. Even in the dense fog they seem to know exactly where they are going. One can tell that they have been here before (even though it has been two years since they last grazed in this area). They disappear into the fog at a pace that far exceeds mine. I just have to hope that they make the journey without my help (which they always do!). By the time I catch up everyone is peacefully and seriously grazing. The fog deadens nearly all the morning sounds. 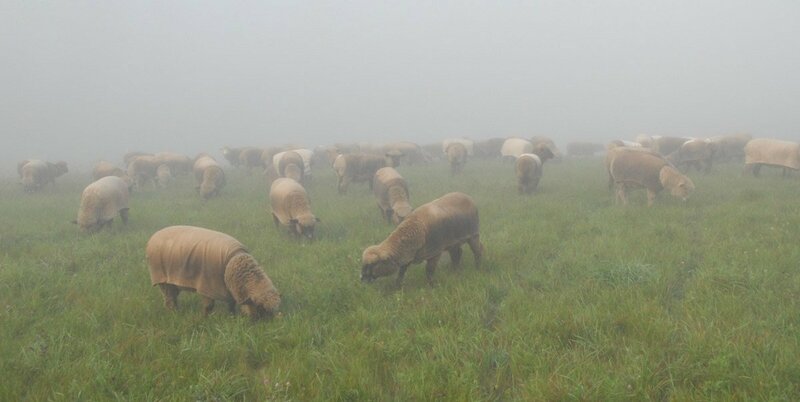 Usually at this time I can hear the group munching away, but the fog silences even that quiet sound. On a couple of mornings the silence is slightly broken by a low flying flock of Canada Geese. I can hear the wing beats and see faint images of the birds flying over head. We often joke that when the flock grazes this portion of the hay field that they have reached the edge of the earth, since none of them have ever during their lives traveled any farther from the barn than here. The fog seems to give new meaning to that description, since it seems that if they go just a bit farther on they will drop off the edge. So far they all have manage to stay put and return to the barn in the evening! I may spend a few minutes with the flock before I return to the barn to get the rams out to their private pasture. Every one in the flock seems truly happy and contented. After I have enjoyed the peace and calm a while, a few of my buddies will acknowledge my presence by looking up for a moment to make sure that I am alright. That at least seems to be what Cha Cha is up to at least. Even the long walk back to the barn is pleasant. It is comfortably cool (unlike so much of the summer!) and exceedingly quiet. I may encounter a few Bluebirds along the fence line. They are still here, but flocking up and I am sure they too will depart soon for southern climates. The walk past the maple grove is usually special. The trees are still green and Goldenrod is in bloom scattered between the trees, yet everything seems to be in pastel shades. 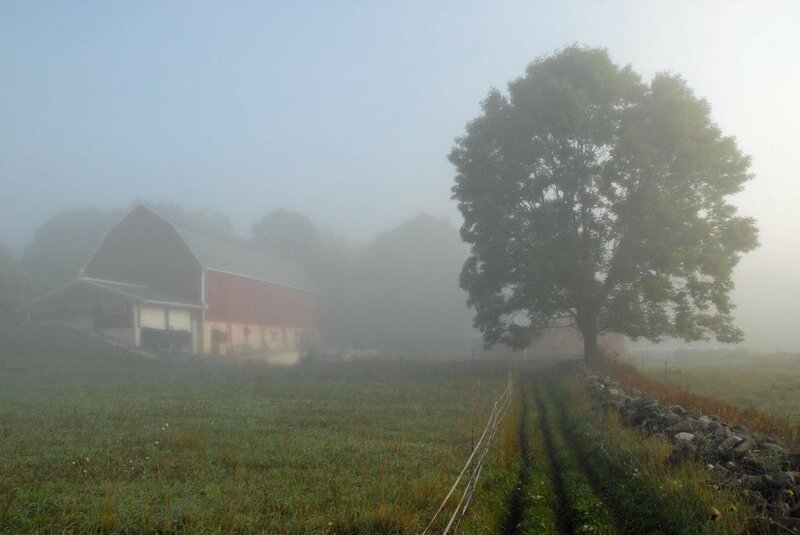 And then, almost as if by magic, the barn appears out of the fog. It is now at least an hour since I first headed out to the pasture and close to the barn, the fog is beginning to burn off. Within another hour the only sign that it was very foggy is a heavy dew that remains on the grass. This morning routine has been repeating itself for almost a week, every day with some minor variation. I will miss it when it stops, but I will enjoy it as much as possible while it lasts. I also believe that the sheep enjoy it as much or more than I do. I love hearing about the start of your day. We can’t wait for our next visit. Your farm has made such a positive impact on us we’re always looking for ways to have that same kind of atmosphere in our home. Moved out of Chicago to find it. Hi Danny and Linda. It is good to hear from you. We are humbled by your comments. We would love to see you two again! The foggy morning is magical. So glad you finally got rain. Your pictures are so very beautiful. We have had lots of rain & consequently a bumper crop of mosquitoes! Wish we had some bats!